First responders dedicate themselves to one of the most dangerous, unpredictable fields in public service. They are highly trained, highly motivated personnel, whose job requires adaptation and the acceptance of significant risk. In recent decades, robotic technology has emerged that promises to mitigate some of this uncertainty and peril. Robots, also known as unmanned systems, come in many forms, from small, remote-controlled devices to vehicles the size of a truck that can "follow" an operator through autonomous navigation. One category has dominated in law enforcement, however, and that is bomb robots. First used in military applications, these life-saving devices are unparalleled in their contribution to the safe identification and removal of explosives, but the utility of robotics extends much further. Bomb detection and disposal are a natural fit for many of the strengths inherent to robotics; they involve precise but predictable movements, can be conducted through a remote control, and remove the operator to a safe distance in case the device is intentionally or unintentionally detonated. Their significant advantage in officer safety has made bomb robots a staple of large departments nationally and internationally, and they have been utilized in the coordinated response to recent tragedies from Colorado to Boston. However, while this technology will no doubt remain invaluable, owning one of these bomb squad robots, which cost upwards of $100,000, is too expensive for many small and rural departments. In preparation for emergencies, many areas have mitigated the high cost issue through mutual aid agreements with larger departments; however, in their day-to-day duties, most first responders are unlikely to interact with or encounter this advanced technology. The success of bomb robots in aiding the military has paved the way for an expanded role of robots in first responder safety and efficiency. Robots have been shown to be reliable, and to provide a situational vantage point that would be dangerous or challenging for emergency personnel to otherwise obtain. Large departments in some areas have already begun to exploit these advantages. From the use of unmanned aerial vehicles in traffic accident reconstruction, to submarine vehicles used to locate objects of interest in murky, inaccessible waters, robots have demonstrated their utility in urban information gathering and investigation. In addition to adding versatility, many of these innovative systems are also emerging with a major advantage in one of the primary barriers of accessibility: cost. Unlike robots in military environments, technology that is built to operate in domestic urban or rural communities generally does not require the same extremes in terms of range, power needs, environment requirements, and application. Because of this, smaller systems produced to address the needs of first responders in their standard duties are appearing on the market at prices ranging from $4,000 to $12,000, rather than in the realm of tens to hundreds of thousands. In addition, as the value of these devices becomes more widely recognized, grant funding from regional and federal agencies, such as that awarded to local departments in California and Ohio, is beginning to be allocated to robots geared toward first responder agencies. If these systems are affordable, and if funding becomes increasingly available, the question becomes: is it worth it? Is it worth the time and resources to a small department to seek out a new technology for their community? These questions are at the forefront of a recent investigation into the application of advanced systems for rural agencies. In December of 2012, UNEQ Consulting conducted a series of experiments at the Southeastern Equipment and Technology Advancement Center (SETAC) facility in Eufaula, Alabama, to examine the benefits of robotic technology to rural first responders. 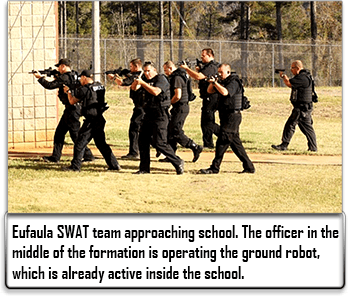 The experiments used two robots and a video distribution device, which were applied to a staged school shooting scenario and included responding members of the Eufaula Police and Fire Rescue departments. 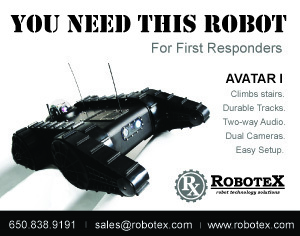 The robots selected for the trial included the Avatar II, an unmanned ground vehicle (UGV) produced by RoboteX, and the AR100-B, a micro unmanned aerial vehicle (UAV) manufactured by AirRobot. These small, mobile systems were selected in part for ease of use, and also for a price point more consistent with rural department funding. 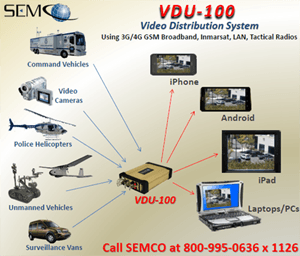 A third device, the VDU-100, produced by SEMCO, streamed the video recorded from these two robots to the smartphones and laptops of first responders in the area and on standby, allowing them to monitor the events as they unfolded in real-time. To simulate the impact robots could have on a large-scale incident, the experiment was divided into two trials: a baseline trial conducted only with the departments' existing resources, and an advanced technology trial, including the robots and distribution device. In prior preparation for the technology trial, participants were provided with training in the robots' use and capabilities. To facilitate this training, UNEQ conducted a series of tests that measured the robots' interior and exterior signal range and quality, application of video, and, for the ground robot, audio range. In both trials of the main experiment, the school staging included injured students, hostages, a mobile perpetrator, and mock explosive devices. The departments responded from their respective stations, established an incident command area, and called for the SWAT team to respond. During the advanced technology trial, the ground robot entered rooms and hallways well in advance of the approaching team, and many of the first visuals of the hostages and suspect were through the operator's screen. 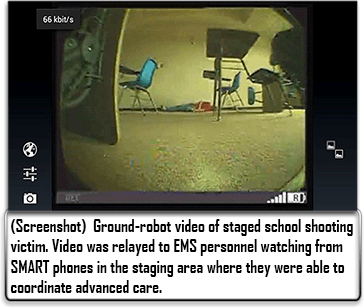 A post-trial report found that the advanced technology trial had several measurable advantages when compared to the baseline, including a reduction in the time required to apprehend the suspect, and the provision of an early visual on the casualties to EMS providers through the video distribution device. In the analysis, it found that "the First Responders used [the robots] to identify and 'clear' avenues of approach and points of entry; see where they could not see without them; locate explosive devices without exposing themselves; identify and attempt to assess casualties; 'clear' rooms, and maintain visual of an area, object, room, or hallway without dedicating personnel. (1)"
Large-scale incidents that fully tax the resources of a rural department are rare. At the same time, the lessons learned by studying the impact of robotics on extreme situations also demonstrate the many everyday benefits that can be gained in safety, efficiency, and information gathering. Collaboration between industry and service personnel is also imperative; companies rely on first responders and their expertise to understand their current needs and areas where assistance is most valuable. As an example of this collaboration, following the experiment, RoboteX provided an Avatar II to the SETAC facility on loan, allowing local departments to continue to find new uses, and to gain feedback that will make the Avatar a better resource for rural departments nationwide. Open dialogue between manufacturers and end users also facilitates an understanding of the financial constraints of small departments, and the need to provide the specific features that they will use in the context of their work. This model and similar arrangement will ensure that moving forward, robotics progresses toward securing what matters most; the safety of first responders and the communities they serve. For a copy of this report, please email mkennedy@uneqconsulting.com with your request.